This sermon, offered by The Rev. Andy Jones at Saint Andrew’s Episcopal Church, in Madison Wisconsin, on March 29, 2018, is build around the reading assigned for Maundy Thursday in the Revised Common Lectionary. Here is a recording of the sermon. May the words of my mouth, and the meditations of our hearts, be always acceptable in your sight, O Lord our strength and our Redeemer. Thirty-eight days of Lent are enough to heighten anyone’s sense of the holy, to attune us to the ebb and flow of the divine and moving around us. But even without this preparation, even without the season that lies behind us, it would be hard not to miss the tension this evening. Jesus knows that he is about to leave and go to his father. The authorities have made their plans. The soldiers lie in wait to arrest him. And here in an upper room, Jesus gathers with his closest disciples to share a meal. In the midst of the tension and anxiety that we feel all around us, it’s natural to long for something, anything to do. And thankfully, Jesus had some very clear instructions for us this evening. As we heard from our epistle reading this evening, this is the setting where Jesus institutes the sacrament of the last supper; telling us to remember him, do this in memory of him, every time we break this bread and drink this wine. Then Jesus washes his disciple’s feet and tells us that we should love one another as he has loved us, that we should love one another as he has loved us. That could be a scary moment. Here as the dark is gathering outside the walls of this place, waiting to crush in on us, loving one another as he has loved us can lead us to some very scary places indeed. But he’s but he’s given us a way, I think, to imagine, to proceed, to participate in that love here in this act in which we are about to participate. Jesus calls us to a life of service, to loving one another through acts of kindness and support. Washing someone’s feet was a task that was relegated to slaves and servants in a household. And here Jesus, the master the teacher, gets down on his hands and knees, with a towel tied around his waist, and washes the filth from the streets of Jerusalem, from the feet of his disciples. I think that there’s something very important for us to hear in the humility that Jesus calls us to in this moment; to wash one another’s feet regardless of rank, or status, or position, to serve one another. But there’s something else going on here too. I’m not sure what it was about feet. Jesus tells us that you may be bathed and clean but you still need to have your feet washed. I was told earlier this week that another sermon about corns, and warts, and bunions, and twisted pinky toes, was not the thing for this evening. So I won’t go there. But I also imagine that it is, see that it is, our feet that carry us into all the places that we’ve been in our lives. Our feet bear the scars and the infirmities of the wrong steps that we have taken, the rocks that we’ve stubbed our toes against, the obstacles with which we have collided, as we’ve blundered around in the dark. Something about his feet, whether it was that bunion or the scars from the places he’d been… Peter didn’t want to reveal them to Jesus. But here’s the thing. If we are going to love one another as Jesus loves us then we need to be prepared serve. We also need to be prepared to be served. Love doesn’t exist without the willingness to be vulnerable. love doesn’t exist without the willingness to reveal who we truly are, to reveal our faults, to reveal our past, to reveal our fears and dreams. If we keep those things hidden under our shoes and socks then we might always doubt that the other really can love us. Because if they knew us for who we really are, with all of our warts, and bunions, and ingrown toenails exposed, surely they wouldn’t love us. So loving one another as Jesus loves us comes in two parts. Love is reciprocal. Love goes back and forth, flows from one to the other. And purely pragmatically speaking, if no one’s willing to have their feet washed then we can’t wash anybody’s feet. We need to be willing to be vulnerable. We need to be willing to risk in order to love. That may be the most important thing that we take away from this evening; that when we encounter people, when we encounter people we like, people with whom we get along… when we encounter people whom we don’t like, with whom we disagree, with whom we don’t get along… we need to be willing to risk taking off our shoes and socks. We need to be willing to risk vulnerability. We need to be willing to let our guard down and enter in to a reciprocal relationship so that there’s some opportunity for us to come together and move forward. Jesus says it is by your love that they will know that you are my disciples. And so I ask you if we’re not willing to take that risk… then who will? This sermon, offered by The Rev. 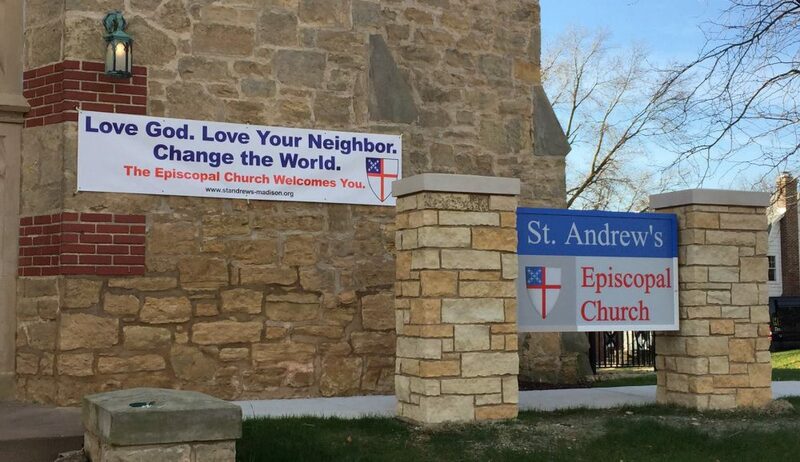 Andy Jones at Saint Andrew’s Episcopal Church in Madison Wisconsin, on March 18, 2018 is built on the readings assigned for the Fifth Sunday in Lent in Year B of the Revised Common Lectionary. Yesterday we said goodbye to Betsy Greene, a longtime member of St Andrew’s, Betsy was 68 years old and died after a two year struggle with a brain tumor. On Thursday we said goodbye to Joan Smith, another longtime member of St Andrew’s. Joan’s husband Jack died just about a year ago. They had lived in a memory care unit for about a year and a half prior to Jack’s death and Joan has lived there by herself since he died. Joan was 85. But on Wednesday, on Wednesday, Mother Dorota and I stood right there, in the gate of the altar rail, at ten o clock in the morning, and we rang the Sanctus Bell seventeen times as we read seventeen names. One sounding of the bell and one name a minute, for seventeen minutes. and to wonder what you would have done in those horrifying 6 minutes…. We stood here in this space on Wednesday morning, ringing that bell, reading those names, as tens of Thousands of students walked out of over 2,800 schools across this country. Children! Your children, my children, our children, confronting us with the fact that we have not done enough to protect them and demanding change, demanding that we do something. That we do… something. “We confess that we have sinned against you, in thought word and deed, by what we have done, and by what we have left undone. We have not loved you with our whole heart. We have not loved our neighbors as ourselves” (BCP page 360). and the evil done on our behalf” (Enriching Our Worship 1 page 56). It is the fifth Sunday in Lent. We have been on this journey for a while now. And the pain of this past week… It’s pretty understandable that we would arrive here this morning exhausted, struggling, seeking some comfort and assurance. “Almighty God, you alone can bring into order the unruly wills and affections of sinners: Grant your people grace to love what you command and desire what you promise…” (BCP p. 219). Deep, deep longing and desire that the world might be changed; that our hearts, that everyone’s heart, might be changed so that we might, as a community, love God’s command and realize a world where God’s dream, that we might all live as one. “I will put my law within them, and I will write it on their hearts; and I will be their God, and they shall be my people” (Jeremiah 31:33b). God promises us – I will write it on their hearts; and I will be their God, and they will be my people. And we hope, we long for that day when hearts are opened and god’s desire for us to love our neighbor as ourselves flows into and out of us and we live as one, in peace. It is perhaps that hope for the realization of God’s dream and vision for all of creation, that gets us through moments like this past Wednesday. That gets us through moments like this past Ash Wednesday, Valentine’s Day! That is a horrifying list… and that only gets us back to June of 2015! But hope, by itself, isn’t enough…. Because my brothers and sisters… God has already written that law in our hearts! That’s why we are here. That’s why these stories hit us so hard… Because with God’s law written in our hearts… our failure to act, to protect our children, strike us as sins of commission and omission – things that we have done, and things that we have left undone; as a failure to love God with our whole heart and our neighbors as ourselves. God’s laws, written on our hearts offer us hope, but they also call us to act! On Ash Wednesday we prayed these words, “Accept our repentance, Lord, for the wrongs we have done: for our blindness to human need and suffering, and our indifference to injustice and cruelty.” Hearing these words in the context of the events of the day is for me a call to action. Lent is the season in which we prepare to reaffirm our baptismal vows and identity. At baptism, we renounced the evil powers of this world which corrupt and destroy the creatures of God. We will reaffirm that identity at the Great Vigil of Easter. I believe I cannot be faithful to that promise unless I stand up to the growing gun culture in our society and those who perpetuate it. My baptismal identity requires me to confront those evil powers and ask others to join me in calling them to account. My citizenship in Jesus’ kingdom requires that I make that way of living the model for life here on earth. If God’s will is life, not death, and we desire that God’s will be done on earth as in heaven, how can there be a place for weapons in everyday life? I think the only thing God wants us to be armed with is his word, his righteousness, and his salvation. Please join me in working to reduce gun violence by working to make it harder to commit. This Saturday, March 24, all across this country, and abroad, the Bishops of the Episcopal Church will join with our children as they “March For Our Lives.” There will be a march in Washington DC and there will be sister marches in major cities in every state of the union. Bishop Miller will be marching with parishes from this diocese and we will be walking with our brothers and sisters here in Madison. Right now the march is scheduled to begin on Library Mall at 10 am. We will march to the Capital where we will hear a series of speakers and then we will march around the capital, joining our voices and standing in solidarity with the children, your children, my children, our children, we are begging, wo are demanding, that we do something, something, to protect them and to make us all safe. I ask you to pray and to consider joining us as we march. We will send out an email to the parish list serv later this week with details about how you can join us as we gather to march as a community, as Jesus’ hands and feet in this world; as we allow the law that God has written on our hearts to move us to action; as we work to bring about God’s will for us; as we choose life over death.